The Physics Groupie Blog: Jupiter Slammed … Again! The big astronomical news from last week was the dramatic visible evidence of an impact on Jupiter that suddenly appeared between July 17th and 19th. 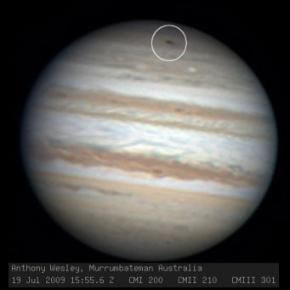 The attached photo clearly shows the new dark marking on Jupiter’s surface that is remarkably similar to the marks left when the Comet Shoemaker-Levy 9 broke up into more than 20 fragments due to gravitational forces and slammed into the giant planet in 1994 (15 years ago to the day). The S-L 9 event was the first direct observation of two objects colliding in space. The recent impact was first reported by amateur Australian astronomer Anthony Wesley on his backyard 14.5-inch reflecting telescope (helleva backyard scope!). There is compelling evidence that the dark mark is black dust resulting from the impact of an asteroid or comet. The spot is located near Jupiter’s southern pole and covers a 190 million square kilometer area, as big as the Pacific Ocean. If anything like this object had impacted with the Earth, it would have meant the end of life on our planet. Fortunately, the large gas giant Jupiter has long been known to be a cosmic vacuum cleaner, shielding the inner solar system of such objects. As result of the impact, The Hubble Space Telescope (HST) team suspended calibration operations taking place on the recently retrofitted telescope and rushed its new Wide Field Camera 3 into service to image the impact mark. Check out the HST website for the most recent images. They are spectacular! What strikes me as being very odd is that an asteroid or comet of sufficient mass to cause such a large impact on Jupiter would go unnoticed by sky watchers around the world. Imagine all the telescopes trained upward at the night sky, and not one was tracking the object before it hit. Actually, the situation presents a distinct opportunity for all you amateur astronomers out there – start scaning the solar system for other objects. I’ve always wanted to track such an object before an astronomical event of this sort. What a great honor for an amateur astronomer to get recognition for a discovery of this magnitude. Does this give you any ideas? If so, get out there with your friends, family, and kids and start looking!